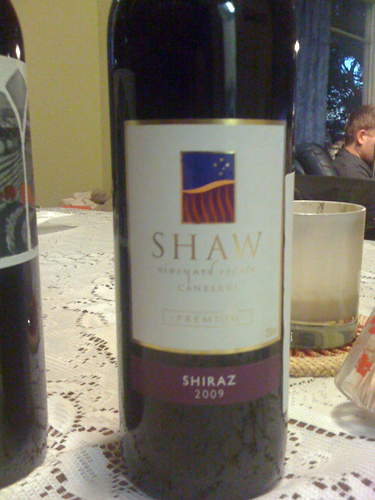 I’d imagine that this will/has one a little wine show bling along the way, largely on the strength of the nose – it’s a very rich smelling Shiraz this one, with plum liqueur, glycerol-rich, juicy sweet fruit jumping right out at you. But when you actually sit down to try and drink it (like I did) it just looks a little jammy and over-sweet (fruit sweet not sugar sweet that is). That full and very fleshy nose is quite typical of the 09 Canberra reds, though in this case it’s just burnt off the regional pepper and spice in the process. It’s a rounded nose actually, one big ripe macerated plum drenched thing that’s ultimately volatile, broadish and heavy. No surprises that the palate is soft, fleshy, warm and very ripe, a blob of a thing, full of sweetly liquered fruit, topped off with raspy acidity on the finish.